I drew this diagram the other day to highlight to myself and others the fact that embedded literacy and numeracy learning outcomes, activities, strategies, and resources all exist on a continuum. It’s pretty easy to say: “Yeah… I’ve embedded that…!” When it comes to certain literacy and numeracy skills that you (hopefully) know that your learners need strengthened in order for you to do your job as a trainer or tutor. However, it’s more difficult to actually point to those activities and say: “See that…! That’s an embedded literacy activity” or “Here’s my embedded numeracy teaching around place value”. The thing is that your embedding is sometimes in what I call “stealth mode”. That means it’s kind of flying below the radar. That means probably your learners don’t really know that they’re doing literacy and numeracy. And perhaps you don’t really know either. What you need to do is get your literacy and numeracy teaching and training out of stealth mode and make it explicit. Then anybody, your learners or your colleagues, should be able to look at your training and identify where it’s actually happening. Then, when you do this you can start measuring the impact that you’re making. And then… once you’re measuring what you’re doing you can start tinkering with it and make some improvements. Prev What are some of the indicators of low literacy and numeracy? How can you recognise low literacy and numeracy as a “non expert”? 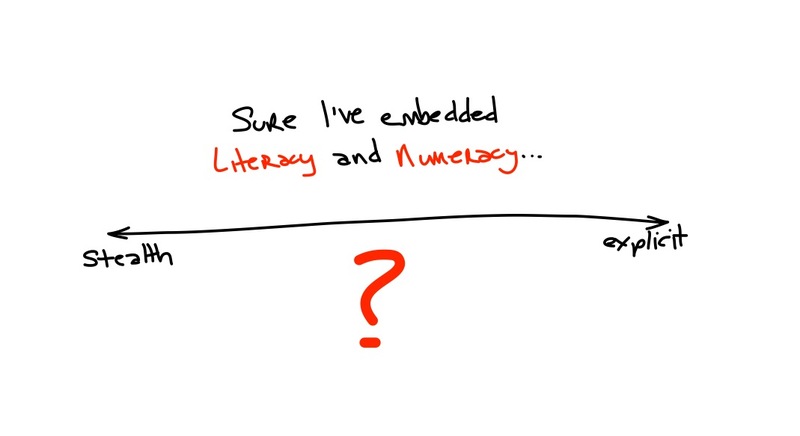 Next Embedding literacy and numeracy: What’s your plan?